A prosciutto wrapped radicchio with homemade balsamic fig reduction is an incredible appetizer packed with flavor. Created by Platings and Pairings, savory meets sweet and tangy with Prosciutto di Parma and figs, an undeniably classic combination, and the grilled radicchio adds a little smoky bitterness for balance. 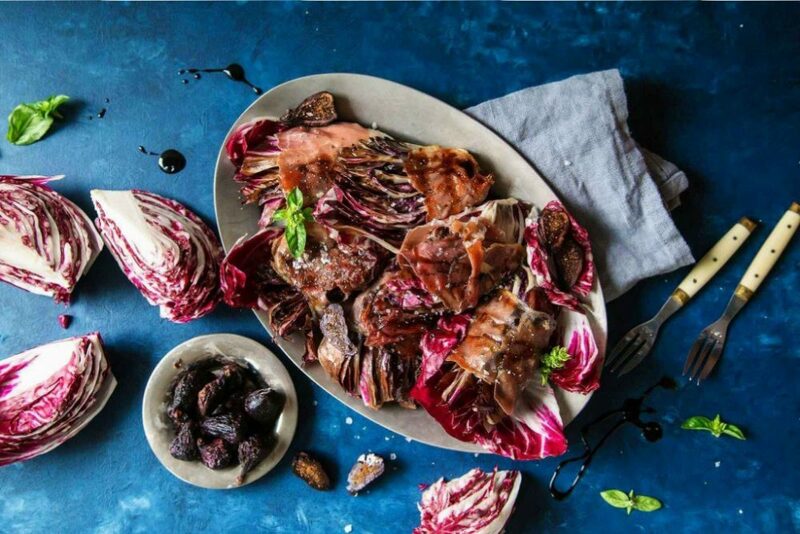 Try this prosciutto wrapped radicchio for a fresh starter plate for hearty meals and serve with your favorite light beer to cleanse the pallet, or a glass of Sauvignon-Blanc for a slightly subdued wine to match the flavor profiles found in this one-of-a-kind dish. Wrap each section of quartered radicchio with a slice of prosciutto. Brush each bundle with olive oil, season with salt and pepper and grill 6-8 minutes, turning frequently, until prosciutto is crispy and radicchio is tender. Meanwhile, place figs and vinegar in a pot and bring to a boil, then reduce heat to simmer. Reduce until thickened, 6-8 minutes. Arrange radicchio on a serving platter and spoon the balsamic reduction on top. Serve immediately.